Huang, J., Liu, Y., Sun, B., Li, J., Zhang, R., and Nie, S. (2019). "Laccase pretreatment for enhancing microwave-assisted alkaline extraction of hemicellulose from bagasse," BioRes. 14(1), 931-942. Laccase pretreatment is a promising approach to degrade lignin polymer for enhanced hemicellulose extraction from bagasse. A Box-Behnken design was employed to optimize microwave-assisted alkaline extraction of hemicellulose with the aim of maximizing the hemicellulose extraction yield. The effect of laccase pretreatment on the structural characteristics of the bagasse hemicellulose was studied with scanning electron microscopy and the Brunauer-Emmett-Teller method. The results showed that the lignin content of the bagasse decreased by 7.9% and the specific surface area increased by 95.9% after pretreatment with 160 U/g laccase for 6 h. The hemicellulose extraction yield was 88.7% under the optimum conditions of 8% NaOH, 50 min, and 900 W. The interaction between the NaOH concentration and extraction time, and between the extraction time and microwave power significantly affected hemicellulose extraction from the bagasse. Overall, the laccase pretreatment was beneficial to extraction of hemicellulose from bagasse using a microwave-assisted alkaline solution. Agricultural by-products are considered to be environmentally friendly and sustainable resources, and hemicellulose is one of its main compounds that represent up to 15% to 30% of the dry matter (Himmel et al. 2007; Park et al. 2017; Li et al. 2018). Hemicellulose, which can be defined as a polysaccharide, consists of glucose, mannose, xylose, and arabinose monomeric units (Nanda et al. 2014). Based on its complex and diverse structural properties, hemicellulose has interesting properties in the bioenergy field (biofuels, power, and/or heat) (Jungmeier 2016), bio-based products (food, feed, chemicals, and materials) (Cherubini and Jungmeier 2010; Dax et al. 2014; de Figueiredo et al. 2017; Peng et al. 2018), and superabsorbent hydrogels (Zhang et al. 2015). Thus, the extraction of hemicellulose with an effective extraction process is a prerequisite for efficient use of hemicellulose. Various methods, such as alkaline pretreatment, hot water extraction, steam explosion, acid hydrolysis, and solvent pretreatment, have been reported in the literature (Ma et al. 2012; Liu et al. 2014; Chandra et al. 2015; Goldmann et al. 2017; Huang et al. 2017). Of these extraction methods, microwave-assisted extraction (MAE) has been accepted as a potential and powerful alternative for the extraction of biomass constituents in recent years because of its high extraction efficiency, special heating mechanism, and eco-friendliness (Felkai-Haddache et al. 2016). Numerous research articles on the extraction of plant compounds with MAE have been published. For example, Gumaling et al. (2018) investigated the extraction of bio-oil from non-edible Swietenia macrophylla seeds using microwave and conventional heating, and they found that microwave pretreatment remarkably increased the bio-oil yield by 5% with an optimum recovery of 43% using a shortened pretreatment time of 7 min (instead of 6 h) with the conventional oven heating method (Gumaling et al. 2018). However, the extraction of hemicellulose from non-delignified biomass may be contaminated with high proportions of lignin or undesirable degradation of hemicellulose may occur because of the strong interaction between the hemicellulose and lignin (Hamzeh et al. 2013; Farhat et al. 2017). Hence, removing lignin during the hemicellulose extraction process is necessary for improving the efficiency. The phenolic hydroxyl groups of lignin were oxidized to form quinones or carbonyl lignin by laccase, which result in the degradation of lignin macromolecules. Ouyang et al. (2105) studied the application of laccase in the degradation of lignin in tobacco stem. The degradation rate of lignin in tobacco stem was 15.9% at 1.3% the dosage of laccase, 50 °C reaction temperature and 4 h reaction time. The aim of the present study was to evaluate the pretreatment of bagasse with laccase for an enhanced hemicellulose yield from MAE. The laccase pretreatment step was employed to alter (open up/loosen/soften) the structure of the bagasse prior to MAE. Then, various extraction process parameters, such as the NaOH concentration, extraction time, and microwave power, were optimized via response surface methodology to attain the maximum hemicellulose extraction yield. Also, the structural characteristics of the bagasse before and after the pretreatment process were examined with scanning electron microscopy (SEM) and the Brunauer-Emmett-Teller (BET) method, which further substantiated the effects of laccase pretreatment on the bagasse. Bagasse was obtained from Nanen Sugar and Paper Co. Ltd. (Xinping, China). It was air-dried and de-pithed before further use. The chemical composition of the de-pithed bagasse was determined and was 47.8% cellulose, 21.0% hemicellulose, 21.6% lignin, and 3.4% ash, according to TAPPI T 203 cm-93 (1993), TAPPI T 249-cm-09 (2009), TAPPI T 222 om-15 (2015), and TAPPI T 211 om-02 (2002), respectively. Laccase OMNO 7015 (activity = 1000 U/g) was procured from Novozymes (Tianjin, China). The enzymatic activities of the laccase were measured according to the methods described by Macellaro et al. 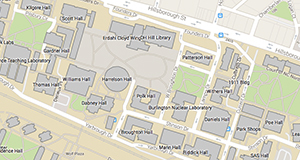 (2014), and all of the experiments were performed in triplicate. All of the other chemicals used were of analytical grade and used without further purification. Deionized water was used throughout the study. Forty grams of bagasse were mixed with 750 mL of sodium acetate buffer (50 mM, pH = 4.5) in a 1-L sealed plastic bag at 25 °C for 30 min. The sample was then pretreated by adding laccase (120 U/g or 160 U/g, based on bagasse) at 50 °C and 150 rpm for 5 h or 6 h. After pretreatment, the bagasse was separated via an 800-mesh sieve and the solid was washed with deionized water until it was neutral. The samples were then air-dried at 25 °C and stored in a sealed bag before hemicellulose extraction. Control assays were performed under the same conditions without the addition of laccase. All of the experiments were performed in triplicate. For MAE, 20 g of pretreated bagasse or untreated bagasse sample were placed in a reactor with 400 mL of alkaline solution (6% to 10%). 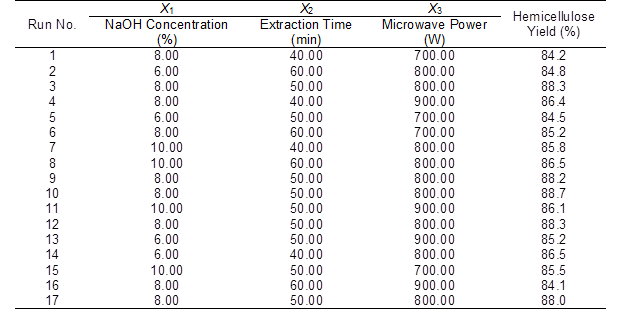 Extraction was performed for 40 min to 60 min, during which time the microwave power was set at a constant value. Different power values of 700 W to 900 W were tested. The pretreatment liquor was separated by filtration. The pH of the filtrate was adjusted to 2.0 with 2 M HCl, and the crude lignin was then removed. For the purpose of hemicellulose recovery, the pH of the supernatant was adjusted to 4.5 with a 1-M sodium hydroxide solution. Three volumes of 95% absolute ethanol were added to the supernatant at 25 °C for 4 h. The precipitated hemicellulose was then recovered by centrifugation. The hemicellulose was washed with 95% ethanol and acetone, and then it was dried at 40 °C. where Q1 is the weight of the extracted hemicellulose (g), Q2 is the weight of the de-pithed bagasse raw material (g), and C is the total content of hemicellulose in the de-pithed bagasse (%). where β0 is the constant coefficient; βi, βii, and βij are the linear, quadratic, and interaction coefficients, respectively; and Xi and Xj are the independent variables of the model. Design Expert software (trial version V8.0.6, Stat-Ease, Minneapolis, MN, USA) was used for the experimental design and response surface regression analysis. The coefficient of determination (R2) and analysis of variance (ANOVA) were used to determine the quality of the designed model. 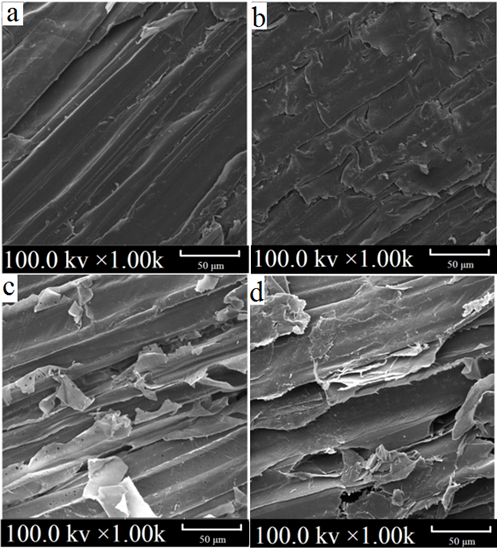 The morphological structures of the pretreated and untreated bagasse were analysed with SEM (VEGA-3SBH, Tescan, Brno, Czech Republic) at an acceleration voltage of 10 kV. The specimens were sputter coated with gold before the micrographs were taken. The specific surface area and porosity of the bagasse samples were measured with an ASPA 2020 micropore apparatus (Micromeritics Co., Norcross, GA, USA). The absorption and desorption of N2 was conducted at 77 K using liquid nitrogen, according to the static volumetric principle. The molecular weight of the bagasse hemicellulose was measured with gel-permeation chromatography (TSK-GEL G-4000 PWxl, Tosoh, Yamaguchi-ken, Japan), according to the literature (Li et al. 2016; Liu et al. 2018). The measurements were conducted with two parallel sets, and the reproducibility of the values was found to be within the range of 6%. The mobile phase was a sodium phosphate buffer solution (0.02 M NaCl, pH = 7.5). The column was a PL gel MIXED-B (Agilent Technologies Inc., Palo Alto, CA, USA). The flow rate was 0.5 mL/min. The column temperature was 30 °C. A refractive index (RI) detector (Water 2414, Milford, USA) was used. The sample mass concentration was 0.005 g/mL and the injection volume was 20 μL. The hemicellulose molecular weight was calculated using pullulan as a standard sample. 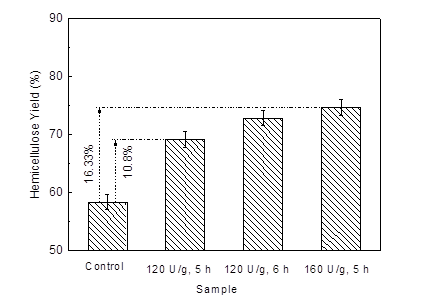 The effect of the laccase pretreatment (pH = 4.8 and 50 °C) on the delignification of bagasse is shown in Fig. 1. The lignin content in all of the samples (except the control) decreased after the laccase pretreatment. For example, a decrease in the lignin content from 21.6% to 16.2% was observed at the laccase dosage of 120 U/g and pretreatment time of 5 h. Also, a marked decrease in the lignin content was noticed at the laccase dosage of 160 U/g. This was attributed to the increase in the concentration of enzyme units in the reaction system, which resulted in an increase in the delignification efficiency. Chen et al. (2018) observed a decrease in the lignin content when the laccase dosage increased from 80 U/g to 120 U/g, while using laccase to treat tobacco stems. The lignin removal effect was less prominent when the reaction time was prolonged from 5 h to 6 h at the same laccase dosage (120 U/g). Delignification increased by only 1.2%. This may have been because of the action of laccase on the lignin surface in the feed at the initial stage of reaction. The lignin of the middle lamella was dissolved during the reaction because it is small molecular lignin. This led to a decrease in the dissolution efficiency. Wang et al. (2015) dissolved pulp from a wood mixture that was pretreated with 90 U/g laccase to extract lignin. The degradation efficiency of laccase decreased as the time increased from 3 h to 5 h.
The untreated sample with an intact structure and tight junctions is displayed in Fig. 2. The surface structure of the bagasse was broken and peeled off. A large number of fragments appeared after the laccase pretreatment. Increasing the laccase dosage above 160 U/g affected the application of subsequent fibers, which verified the effect of the laccase pretreatment on the lignin content of the bagasse. Similar behavior was reported by Avanthi and Banerjee (2016), who found that the surface morphology of a lignocellulosic mixture had a rough, distorted, and porous structure after pretreatment with 167 U/g laccase at 35 °C for 6 h.
Table 2 and Fig. 1 show that compared with the control sample, the specific surface area (SSA), total pore volume (TPV), and average pore size (APS) of the bagasse increased after the laccase pretreatment because of fragments on the bagasse surface and dissolution of small lignin molecules. The SSA, TPV, and APS increased by 55.5%, 11.3%, and 6.3%, respectively, after pretreatment with 120 U/g laccase for 5 h. The SSA and TPV of the delignified biomass after pretreatment increased compared with those of the raw materials (Banerjee et al. 2017; Yan et al. 2017). Upon extension of the pretreatment time to 6 h, the SSA, TPV, and APS of the bagasse further increased. Therefore, after the laccase pretreatment, the lignin content in the feed decreased, but the porosity of the bagasse increased, which enhanced the efficiency of the extraction solution and the dissolution rate of hemicellulose. The extraction of bagasse before and after the laccase pretreatment was investigated using the microwave-assisted alkaline extraction method with a NaOH concentration of 6%, extraction time of 40 min, and microwave power of 1000 W (Fig. 3). Compared with the control sample, the bagasse hemicellulose yield was found to increase considerably after the laccase pretreatment. For example, the hemicellulose yield increased by 10.8% and 16.3% at laccase dosages of 120 U/g and 160 U/g, respectively. The stable structures of cellulose, lignin, and hemicellulose in the bagasse were broken during pretreatment, which increased the hemicellulose yield. This was further confirmed via SEM images (Fig. 2) and by the porosity values (Table 1). Furthermore, Fig. 3 shows the hemicellulose yield was found to increase with the pretreatment time. 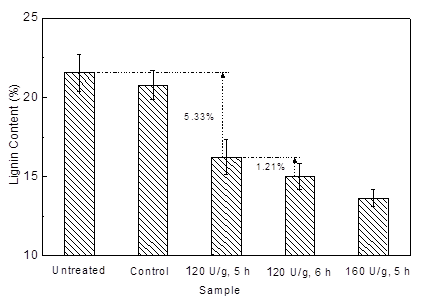 For example, the hemicellulose yield increased by 3.66% when the time increased from 5 h to 6 h.
Table 3 shows that the molecular weight of the hemicellulose obtained after laccase pretreatment was higher than that of the hemicellulose from the untreated samples (6320 g/mol and 13320 g/mol), and it increased with the laccase dosage. This demonstrated that the laccase pretreatment enhanced the extraction of hemicellulose and reduced hemicellulose degradation by alkali. Farhat et al. (2017) also reported similar results for the molecular weight of hemicellulose from delignified switchgrass pretreated with 30% NaOH solution and 70% anhydrous ethanol. The dispersion of hemicellulose obtained in this study was low, particularly at the laccase dosage of 120 U/g and pretreatment time of 5 h. The change in the molecular weight and dispersion further showed that the laccase pretreatment improved the extraction efficiency of hemicellulose and promoted the partial extraction of high molecular weight hemicellulose. The ANOVA results are presented in Table 5. The F-value and p-value of the model were 8.34 and less than 0.0001, respectively, which showed that the model fitted well and could be used to analyze and predict the hemicellulose extraction yield from bagasse. The coefficient of determination (R2) was 0.98, which indicated that the response value has a significant linear relationship with the corresponding variables. Also, the adjusted R2 was 0.96, which indicated that the model can explain 96% of the change in the response value. Additionally, the values of the linear terms X1, X2, and X3, the interaction terms X1X2 and X2X3, and the quadratic terms X12, X22, and X32 significantly affected the hemicellulose yield from the bagasse. The influence of the experimental factors on the response value was not a simple linear relationship. Therefore, the model can be used to analyze and predict the bagasse hemicellulose yield. Response surface plots of the interaction between the independent (NaOH concentration, extraction time, and microwave power) and dependent variables (hemicellulose yield) are shown in Fig. 4. The significant effect of NaOH on the hemicellulose yield is shown in Fig. 4. The hemicellulose yield increased as the NaOH concentration increased from 6% to 8%, and reached the maximum value of 88.7% at the 8% NaOH level. It was also seen that the interaction terms (X1X2 and X2X3) significantly affected the extraction of hemicellulose from the bagasse. This result was similar to that reported by Minjares-Fuentes et al. (2016), who extracted hemicellulose from grape pomace. These authors reported that the extraction time and KOH concentration had strong interactions. 1. The surface structure of bagasse was broken and peeled off, and the specific surface area (SSA) and total pore volume (TPV) increased by 90.5% and 26.7%, respectively due to the laccase pretreatment before alkaline extraction. 2. The hemicellulose yield was 88.7% under the optimum conditions (8% NaOH concentration, 50 min, and 900 W). 3. The two interaction terms (X1X2 and X2X3) had significant effects on hemicellulose extraction. 4. The weight average molecular weight and number average molecular weight of the hemicellulose from the laccase-treated bagasse increased by 27.5% and 36.6% compared with those of hemicellulose from the untreated bagasse, respectively. The authors gratefully acknowledge the financial support from the National Natural Science Foundation of China (Grant Nos. 201466017 and 31460176) and the Dean Project of Guangxi Key Laboratory of Clean Pulp & Papermaking and Pollution Control (KF201602 and KF201718). TAPPI T 203 cm-93 (1993). “Alpha-, beta- and gamma-cellulose in pulp,” TAPPI Press, Atlanta, GA.
TAPPI T 211 om-02 (2002). “Ash in wood and pulp,” TAPPI Press, Atlanta, GA.
TAPPI T 222 om-15 (2015). “Acid-insoluble lignin in wood and pulp,” TAPPI Press Atlanta, GA.
TAPPI T 249 cm-09 (2009). “Carbohydrate composition of extractive-free wood and wood pulp by gas-liquid chromatography,” TAPPI Press, Atlanta, GA. Article submitted: October 11, 2018; Peer review completed: November 24, 2018; Revisions accepted: December 10, 2018; Published: December 11, 2018.